Empty green space at the corner of Westpark Dr. and Rt. 7. Image courtesy of Google. Aerial view of empty green space along Westpark Drive. Image courtesy of Google. Tysons Park Concept Plan. Image courtesy of Fairfax County. Nature is at a premium in Tysons. The area is surrounded by beautiful natural preserves, for example at Wolf Trap, Raglan Road Park and all along the banks of the Potomac River. 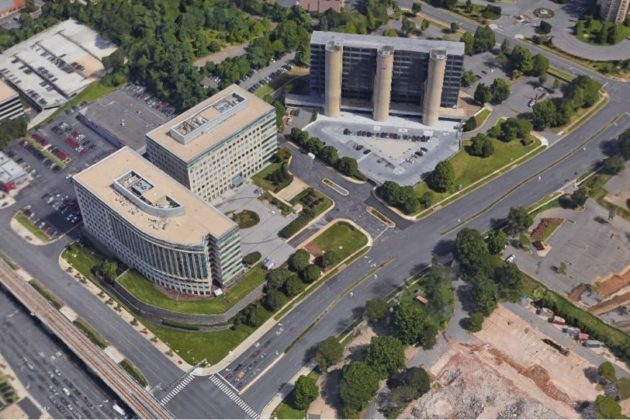 Within Tysons itself, though, there is more concrete and asphalt than grass and trees. Where there is grass, it’s often in the form of a manicured but empty lawn. These lawns represent space that has been ecologically, socially and environmentally wasted, but they could easily be repurposed. 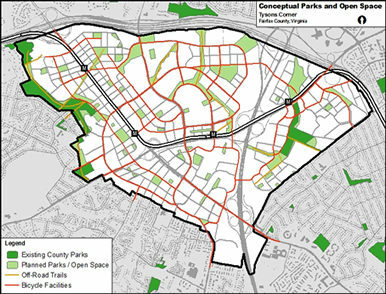 Fairfax County has an ambitious plan for the future of the area’s parks, calling for a network of parks and urban oases connected by a recreational trail. This plan is long-term, looking forward to 2050, hoping to bring 1.5 acres of green space for every 1,000 residents. It won’t be completed easily, although at least one new park has opened recently. Though nature might be rare in Tysons, that doesn’t mean that green space is. In fact, Tysons boasts a large number of lawns and fields of varying sizes. The problem is that these spaces are green in color only. 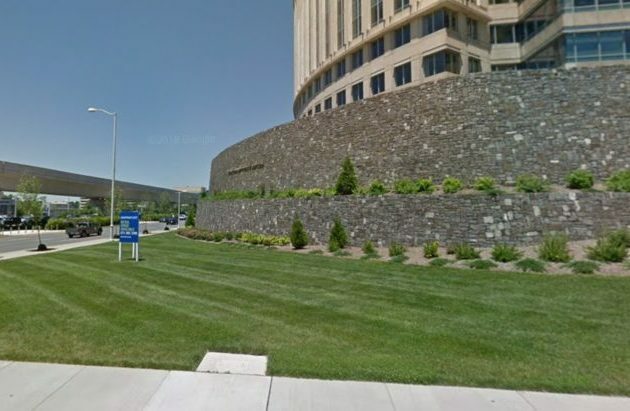 They don’t contribute anything to the Tysons community: lawns are neither parks nor plazas nor natural preserve. Environmental scientists find that lawns of this kind aren’t at all ‘green’ in the ecological sense. Because of the fertilizers and pesticides used to maintain them they produce more chemical runoff than they absorb. They also consume an enormous amount of water and gasoline for the mowers that keep them trim. Socially, these lawns don’t satisfy a community’s need for open space. Take a closer look at two spaces along the north side of Westpark Drive, near Route 7. These sites are only about two blocks from a Metro station and are directly across from The Boro development expected to bring many new residents and new street-level pedestrian and retail activity. But, recently, Fairfax County has been embracing more effective regulation. In 2010, Fairfax adopted a Zoning Ordinance Amendment that enables a more urban and denser form for new construction in Tysons. This amendment is governing the development taking place across the street from these two lawns, and will hopefully result in a much more economically and ecologically efficient use of space. Green lawns are on that list — but only as one item, and only because of their use to the community.